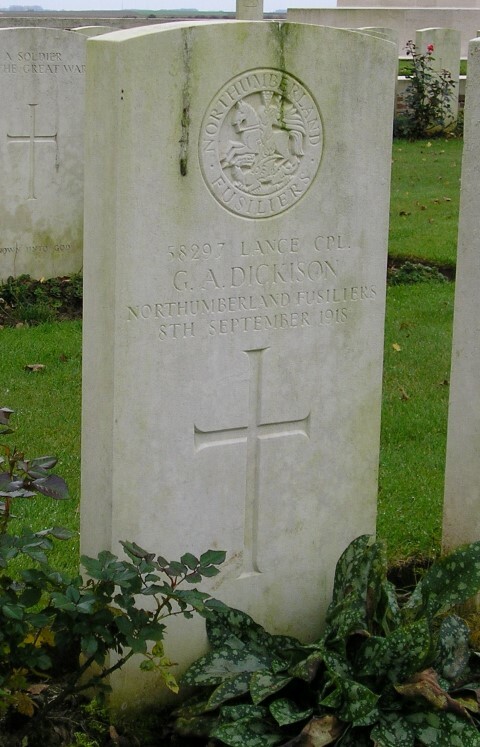 58297 Lance Corporal George Andrew Dickson, 12/13th Northumberland Fusiliers was killed in action 8 September 1918 and is buried at Gouzeaucourt New British Cemetery, France. He was 24 years old and is commemorated on Copley War Memorial and the memorial plaque in St. John the Evangelist Church, Lynesack. In 1901, the family lived with Jennie’s father 80 year old blind, widower George Parkin and her brother 41 year old George William at Copley Lane. Robert Dickson hailed from Scotland and was a self-employed tailor. Jennie was born at Lynesack. By 1911, the family lived at Dent Bank, Middleton-in-Teesdale where Robert was employed as a tailor for the Cooperative Society. 17 year old George was an assistant grocer. 10 August 1917: the 12th and 13th Battalions amalgamated becoming the 12/13th Battalion. L/C Dickson was killed in action,  the date of his death being 8 September 1918. The 21st Division was not involved in any major battle at that time. It is recorded that 1 officer and 22 other ranks serving with 12/13 Northumberland Fusiliers were killed in action or died of wounds 8 September 1918. The 12/13 War Diary has not been researched therefore the exact circumstances of their deaths is unknown to date. 58297 Lance Corporal G.A Dickson was awarded the British War and Victory medals. Lance Corporal G.A. Dickson is commemorated on the Copley War Memorial as G.A. Dixon, the Memorial Plaque in St. John the Evangelist Church, Lynesack as Andrew Dixon and George Andrew Dickson. CWGC record him as G.A. 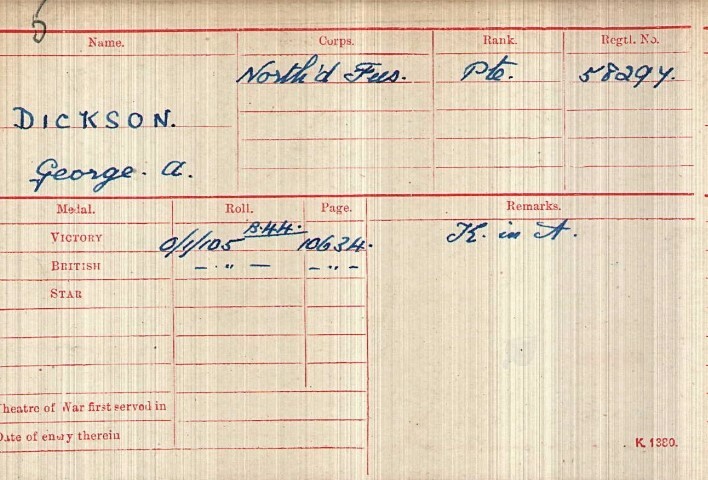 Dickison, the Infantry Record Office (York) and Medal Roll as George A. Dickson. Soldiers Died in the Great War Note: his name is given as Dickison and it is recorded that he was born at Tynedock – those transcribing the details for SDGW may not have been familiar with Lynesack.